This is a half sheet for Under Fiesta Stars and it has a style mark in the bottom right corner, so it's the style B half sheet. 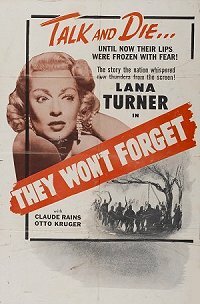 The original release year was 1941. This is definitely a reissue but no one knows WHEN. All major auction houses have this listed as a R40s or R50s reissue. There is no copyright information and it doesn't have any NSS information. So, this is the R45 Half Sheet, style B. 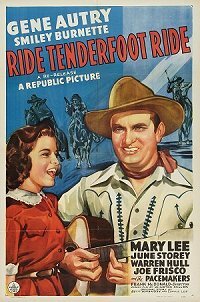 Here is a reissue for the title Ride, Tenderfoot Ride. It's a Republic with no studio or logo change. No copyright date and no year. BUT, Morgan Litho did the plates, and gave a plate number. Here is the plate number shown on the right. Plate number 24367. Go to Member Section - Countries - North America - U. S. On the left navbar, go to lithographers log and down to Morgan and then click on Regular Log. Go down the list until you are in the 24000s. Go to where 24367 would fit and look at the years. It's a 1943.... That simple!! This is an odd reissue in the 1940s or 1950s with NO information. NOTICE.. There is NO Warner Brothers logo or tag, so this was reissued by a small distributor, with NO information on it and no litho plate numbers. Dominant was the primary re-distributor of Warner Bros. BUT Dominant always put their logo on their posters and was a decent sized distribution company in the mid 1950s through 1959. So it's VERY doubtful that it was issued by Dominant. The place to start on this type of piece is the NSS Trailer Logs, so Member Area - Special Section - National Screen Service. Look down the left navbar to Trailers and click on Trailer Logs. Go down to the bottom of the page - We don't know YEAR and we don't know Distributor, so click on Title. It's alphabetical so go down to They Won't Forget and you will see that NSS made a trailer in 1956 #56 0443. It was a reissue made for Eden Films. For more information on it, you can back up a page and look in the log by Distributor for Eden Films, and you'll see that Eden Films reissued about a dozen films in 1956. They notice that there is a parenthesis () after the company name showing (Dominant). This means that Dominant bought them out.